Fishing for crabs in the Bering Sea takes strength, endurance and some serious crab pots. Weighing up to 800 pounds when fully rigged for deployment, these pots are the picture of durability and efficiency. The frames are typically composed of thick steel bars covered with netting or wire mesh, and openings of different sizes and shapes are used depending on the type of crab being targeted. Pots make the big catches in the crab-fishing world, and they come in a variety of forms. According to the Alaska Department of Fish and Game, king crab pots generally range from about 6 by 6 feet to about 8 by 8 feet, with heights between about 2 and 3 feet. 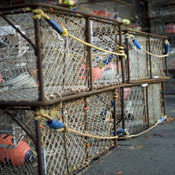 To catch smaller species of crab, like Tanner and snow crabs, king crab pots can be modified with more restricted openings and additional layers of mesh or netting. Others can be circular or pyramid-shaped, and some come with exits for crabs that are too small to be legally caught. If any underage or female crabs are hauled up, they must be thrown back. So if crab pots can weigh nearly 800 pounds when they hit the water, you might be wondering how on earth they're ever hauled back on-board. A typical crab boat might carry between 150 and 300 pots, and once they're baited up with herring, codfish or some other enticing snack, they're dropped down to the depths, usually for a day or two. A hydraulic system is employed to lift them back up, and then it's time to inspect the haul and sort out the keepers. One interesting feature found in regulation commercial crab pots is an automatic release mechanism. Possibly a section of biodegradable mesh, a dis-solvable cord or other similar device, over time these mechanisms disable crab pots, making them unable to trap any more crabs that wander inside and preventing them from ghost fishing — continuing to catch crabs after they're derelict. In the event a crab pot is lost — maybe a storm or a boat propeller separates it from its buoy — eventually the apparatus (a cotton bio escapement panel, for instance) will decay and create an exit for any incarcerated crabs. There are some issues with unlawful crab pots in parts of Alaska — especially among individual and subsistence crabbers — that don't follow the regulations calling for these emergency escape hatches. Such sunken death traps can still lure crabs in, but don't offer them the opportunity to crawl back out if fishermen never arrive to haul them to the surface and send them on their way to the seafood store.